I’m A Pool Snob? Maybe. My family and I have a membership to the YMCA, and we’ve used it a few times to visit their pool this summer. But frankly, I get bored of the Y pool. We have to fight for a chair (because there’s never enough), or else we’re stuck braving the blazing hot cement with our towels. There are sporadic shaded areas, and usually we end up at the only available shade spot… right under the trash can. My son prepares for a swim. Great. I’ve always loved the smell of trash when I’m lounging in the sun. No really. Complaints aside, maybe I’m just a pool snob because I live in Las Vegas and, just a few miles away on The Strip, there are awesome hotel pools to visit instead? Lucky for us, most of the hotel pools allow locals in for a price. I’ve seen almost all of the major hotel pools on my trips to The Strip, and have swam in a few of them. 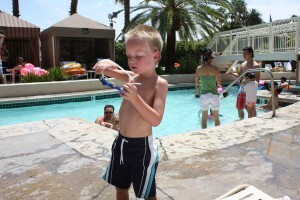 One of the most exciting, family-friendly pools is Mandalay Bay’s. My husband has a membership to Mandalay Bay’s exclusive club called Foundation Room and, as part of the membership, we’re able to use the pool for free whenever we want. It’s one heck of a pool, too – it feels like a little city inside! 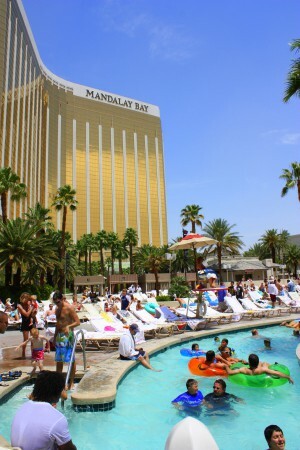 A person could spend the entire weekend at Mandalay’s pool and never get bored…maybe that’s the idea? There’s shopping, cabanas, an outdoor cafe that actually has great food, and four pools to swim in. Yes, four. Pool guests enjoy the lazy river. 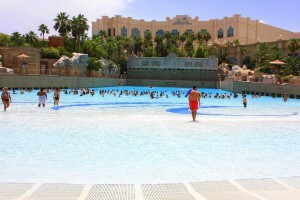 The largest – a wave pool – has real sand under the lounge chairs and a music stage in the pool which is used for evening concerts. There are two smaller pools around the back of the main one, and both are good sized and very clean. A lazy river swirls around private cabanas near the main pool. The river’s current is a little too fast for my taste – it’s strong enough to carry off my five-year-old son if I’m not paying attention – and so it makes me a bit nervous. But it’s one of my kids’ favorite parts of the visit. If I don’t want to brave the lazy river unprotected, there are inner tubes available for purchase for $24 (yes, we have to buy them). I’m not sure what a tourist would do with a huge inner tube once they’re ready to fly home (too large for a carry-on bag you think? ), but I’ve seen some people selling them back to other visitors on their way out of the pool. Maybe I’m just a stressed out housewife and, although it’s fun, I don’t think taking two kids to any pool is particularly relaxing. Keeping track of two, excited little kiddos while remembering to put sunscreen on, making sure they don’t swallow too much water, and that they’re well hydrated and fed is not an easy job. However, thanks to my super husband, he’s happy to take the kids into the pool and leave me to my lounge chair and pina colada. This is my favorite part of the pool visit because it gives me a few minutes to take a break from being mom (the pina colada helps!). The moral of this story? It’s great to be a Las Vegas local, because where else can I get a pool experience like that with my family? The YMCA pool is fun, but Mandalay Bay is even more fun. I only just discovered that some hotel pools would let locals visit for a fee, and took out of town visitors to the Golden Nugget pool yesterday. The slide that goes through the shark tank is the absolute highlight of the little one’s trip. Thanks for the heads up on other places you don’t have to be a hotel guest to go. I agree- the Golden Nugget pool is a blast. I even wrote a blog about it on my personal website. The Station Casinos also allow locals into their pools for $10 a person. It’s an insider’s tip- it’s not advertised online! Call your local Station for more information. When I moved here in 1990, the first thing I did was seek out a health club with an outdoor pool. That led me to be a loyal member of what is now Club Sport Green Valley. They have both indoor and outdoor pools, heated year round.It’s well worth the monthly membership. You get what you pay for. I totally regret not getting to the shark tank pool at the Golden Nugget when they were having a ‘free for locals’ promotion. Isn’t it like $20/pp if you’re not a guest? But then again, $20 for all day at a fabulous pool? It’s worth the cost in my opinion!